Browsers, Clouds & Computing: On Universal Applicability of the Scrum Framework. On Universal Applicability of the Scrum Framework. Meetup Announcement. (Click to go to Meetup page). 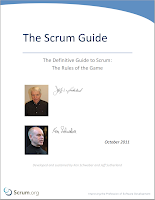 If you listened to Jeff Sutherland on the July 16 talk on "Scrum: The Future of Work", you cannot but walk away with the feeling that scrum methodology is more universally applicable than software development, but the rest of the world is yet to discover that fact. And, his enthusiasm for Scrum's applicability not just in Software Development, but in other parts of Enterprises, in Government, in non-profit organizations, etc., is contagious. Scrum and the Grameen Bank, the Nobel Prize winning microfinance organization? 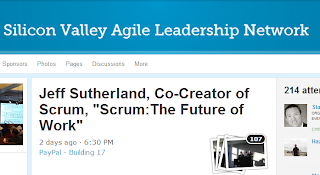 You can find the slides and the video of the proceedings at the Silicon Valley Agile Leaders Network Conference by Scrum, Inc. In July of 2012 there were 20,000 Scrum jobs open in the U.S.
Today, there are 600,000 Scrum jobs open in the U.S.
And, there was the anecdote where many of the original scrum ideas were indeed borrowed from the microfinancing operations of Grameen Bank and, 20 years later, a Scrum Master is working with the Grameen Bank to improve their scrum practices. Talk about life coming around full circle! At about 0:43:00 in the video, Jeff talks about how the Toyota Prius team started using scrum "to build a car that gives twice the mileage of its predecessors, ... to make a greener planet, ... to make the world a better place, and, ... to ... ship in half the time." You can watch a YouTube video of the presentation here. Click to open the Guide. None of the foregoing concepts have anything specific to software development, although these concepts have gotten formulated and solidified over the years during the use of scrum in software development. The coming months and years will be interesting to watch as the utilization of the scrum framework spreads. Scrum can definitely be used outside software development. And at non-profits and governmental orgs. And in families. I have seen it with my own eyes and I know many others who have too. The question then is: Why is there such reluctance within enterprises to go 'all-in' for scrum? Because your business is similar to others does not make it the same, and these often subtle differences in the way different businesses operate and are managed mean that the systems and software that suit one business will not meet the requirements of another company.We offer a wide range of Web Developer Leeds services for mobile handheld PDA devices. That surely leaves an appreciable impact overall when we see the was of learning and knowing the majority of factors that help us agile consulting companies are the people who are doing fine enough in many ways and that should be the way of learning and improving.